Remedy 1: Take one banyan leaf after bathing on Tuesday morning. Clean it with clear water. Keep this leaf in front of Hanuman. Write Shriram with saffron. Keep it in your wallet. You won’t face shortage of money. Flow it in river when it becomes dry and repeat measure. Remedy 2: Take bath and wear clean clothes. Light lamp in front of Hanuman and offer chola. Light jasmine oil lamp. Use jasmine oil to offer chola. Offer rose flower garland after chola. Offer Kevada fragrance on his shoulder. Keep jaggery-gram on leaf and offer it to Hanuman. Chant special psalm with basil garland. The psalm would be “Ram Rameti Rameti Rame Rame Manorame. Sahastranam Nam Tatunay Ram Name Varane”. Take one rose from garland and keep it on money place. Keep it in red cloth. Remedy 3: Visit lord Ram and Hanuman temple on Tuesday evening. Light pure ghee in front of Rama and Hanuman. 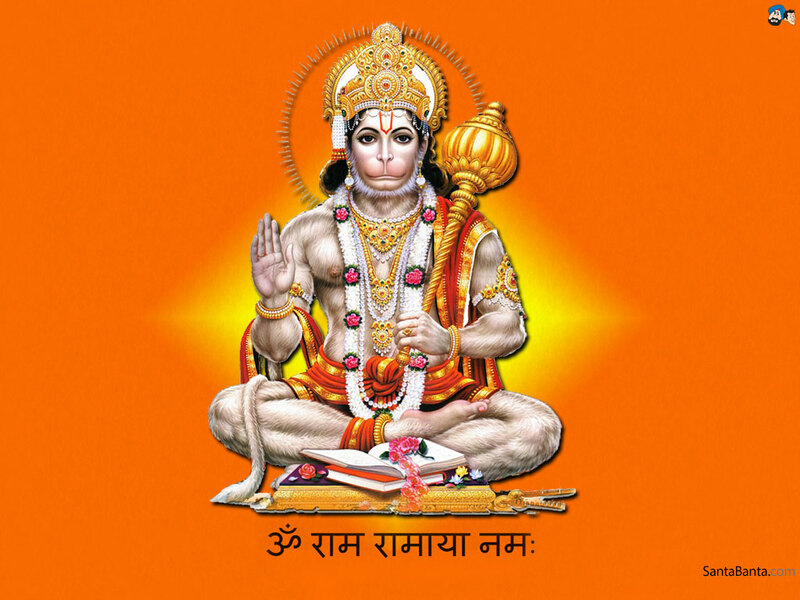 Sit in front of lord Rama image and chant Hanuman Chalisa. 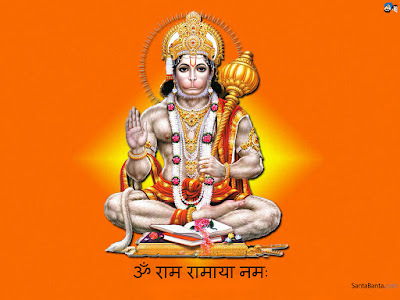 Sit in front of Hanuman image and chant Ramraksha psalm. One gets mercy of Rama and Hanuman. Remedy 4: Visit Hanuman temple for six Tuesdays. Sit in front of Hanuman idol and chant Ramraksha psalm. Offer jaggery and gram to Hanuman. Share your problem with Hanuman and prayer to get rid of it. Remedy 5: Take 11 or 21 banyan leaves after bathing on Tuesday morning. Wash it with water and write Shri Ram with sandalwood and prepare garland. Use raw yarn to prepare garland. Offer it to any Hanuman temple. It is extremely beneficial remedy to please Hanuman. Remedy 6: Offer vermillion and jasmine oil in Hanuman temple on Ramnavami. Tell your wishes after offering oil. Remedy 7: Wear clean clothes after taking bath in morning. Bow to parents, idol, favored and your god. Sit on Kush bench and chant psalm in front of mercury image of Hanuman. The psalm would be “Om Namo Hanumantaye Rudravtaray Sarvsatrusaharanay Sarvarog Haray Sarvavashikaranay Ramdutaye Swaha”. Use red hakik garland to chant this psalm. Remedy 8: Prepare packet of red lentil and coal on Tuesday. Keep one rupee coin in packet. Peel of it from head and flow it in river. Visit to Hanuman temple and chant Ram name. It is extremely beneficial to reduce Shani dosh. Remedy 9: Wear clear clothes after taking bath on Tuesday morning. Sit on red bench facing east side at silent place. Wear red or yellow dhoti. Keep red cloth on choki. Keep Hanuman image on choki. Keep Shri Hanuman yantra on red flowers in copper plate. Do tilak with vermillion. Offer red flowers. Worship with dhup, lamp, rice, flower and dainty. Light mustard or sesame oil lamp. Add both hands and worship Hanuman. Remedy 10: Keep mercury image of Hanuman in home. Worship every day to Hanuman. It is beneficial in Pitrudosha. Remedy 11: Prepare Hanuman image with oil, gram flour and lentil flour. Do pran-pratisha of image. Light oil-ghee lamp and worship it. Offer puva and sweets. Prepare betel leaf with 27 leaves, supari and offer it to Hanuman. Do Aarti and share your desires. Worship lord Hanuman. Flow image in water and feed Brahmin. You can also make donation.